Although starting his successful career in photography in 1946 at the age of 15, there was one success that eluded him. Feinstein never published a monograph of his early work. It was only admired elsewhere, including the Museum of Modern Art, after supporter Edward Steichen had purchased it. But unlike such showings, online and offline, there has always been something more permanent about print. While new photos can always be hung on a museum wall and online galleries have a way of eventually fading into obscurity, every printed portfolio lasts until the paper finally crumbles away. Harold Feinstein: A Retrospective has found its place in history. Feinstein became a prominent figure in the vanguard of early New York photography. His work was shown frequently. It was often exhibited in galleries such as the Helen Gee's Limelight Galley. Today, some of his work is represented in the permanent collections of major museums including the Museum of Modern Art, International Center of Photography, and the George Eastman House. But his name has continued to escape the public as his work was less accessible than many historical talents. At least, this was the conclusion of his supporters. They all wanted to see another chapter in the career of Feinstein. And that chapter, for Feinstein at the age of 80, would be about finding a champion in Jason Landry from the Panopticon Gallery. Landry asked others to make this dream possible. The book opens with photos of New York City, Brooklyn, Harlem, and, of course, Coney Island. His compositions are a cut above, frequently using light, silhouette, motion, and reflection to add depth. Many of the photographs are spontaneous, capturing life as it happens. There are boys running into the surf, men with bulging bellies, women brushing sand out of their pockets, and scores of people from an era where suits were as common as swimsuits on the beach. What is equally striking is that even those shots that are portraits by nature are never posed. While it is difficult to tell at times, there is a sense that his subject either noticed him at the last second or he called them just before snapping the photograph. 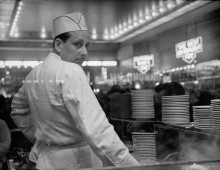 More than that, he captures life in the late 40s, early 50s. The juxtaposition of Coney Island and Korea. And then, it abruptly gives way to something else. Starting with a solider standing guard on a desolate road in Korea and several more photos of men leaving for training camps and foreign shores, the mood is permanently altered. The photos are no longer innocent. The freedom becomes the uniform. Following the Korean portraits, his work transforms into documentary portrait. The last of his jubilance disappears into something profound, mature, lovely, and haunting — a handful of landscapes and portraits from New Jersey to Paris. In closing, Feinstein finishes the work with a thought. He states it simply, beautifully. He loves this life, and has always strived to share his love for it with others — saying "Oh, will you look at that." There isn't a more perfect way to conclude the work. And what makes it so perfect is that once you have reached the personal message left by Feinstein, you suddenly feel invited to travel back though the journey — this time appreciating that the pictures are not just photographs but a portrait of his life. Harold Feinstein: A Retrospective Captures 9.1 On The Liquid Hip Richter Scale. If there is anything that rings even mildly disappointing about the book, it is that it has to end. The journey feels too short. But that isn't a critique about the production as much as it is a praise of Feinstein's explicitly human and sometimes intrusive work. He saw things no else could see … that is, until he shared them. 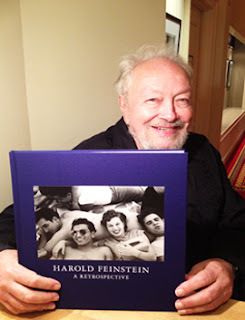 Harold Feinstein: A Retrospective is a specialty book published by Nazraeli Press. You won't find it elsewhere. He does have several other landmark books published. They include the direction his later talent took him. One of the most amazing is One Hundred Flowers. His photography is noted for its exquisite detail and turning each photo into mesmerizing works of arts through his lens.